Spaghetti Squash Au Gratin. 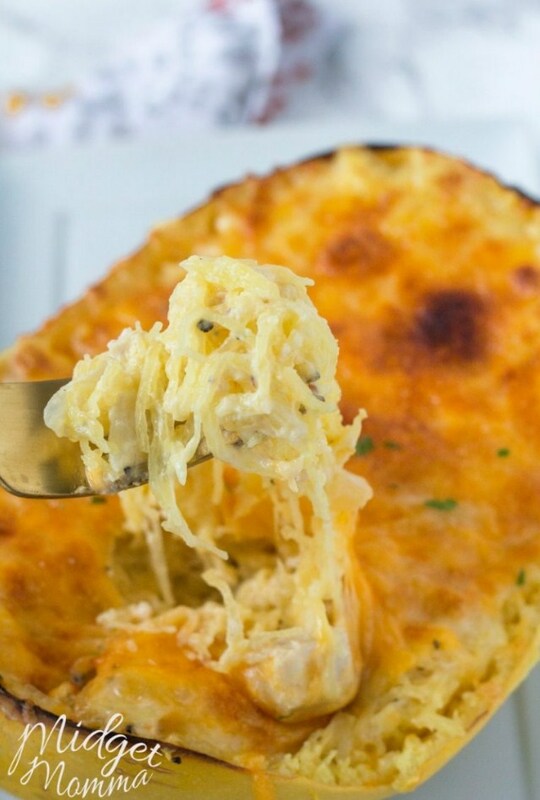 This amazing easy spaghetti squash recipes is cheesy and amazing. It is always a crowd pleaser when I make it! 2 chicken breast about 3/4 a pound-1 pound depending on how much chicken you prefer in your dish. Cut your chicken breast so you have four pieces of chicken. Place the chicken on the sheet pan, season with salt and pepper. Bake for 45 mins or until cooked to a touch with a fork. When the squash is cooked Scrape the flesh with a fork to create noodles and dice your chicken in to small pieces. While the chicken and squash are cooking place the onions with the butter in a pan on the stove over medium low heat until very soft. Once everything is cooked combine the noodles, chicken, onion, yogurt, 1 cup of the cheese, salt and pepper in a large bowl. Place the mixture back into the empty shells and top with the cheeses and place under the broiler until golden brown. This recipe makes 6 servings if you are making it as a side dish and 2 servings if you are making it as a full meal item. If you are strict Keto then you can use sour cream instead of the greek yogurt.